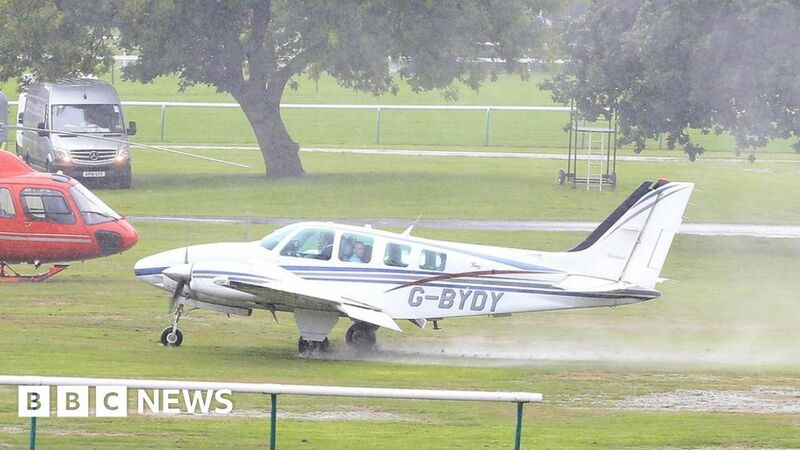 A pilot has been praised for doing an “amazing job” regaining control of a light aircraft that apparently skidded on landing at Haydock Park racecourse. The light aircraft was carrying horse trainer Richard Hannon and collided with a stationary helicopter at the Merseyside venue. No-one was injured. Champion jockey Frankie Dettori was set to fly in for the Sprint Cup, but the runway was closed following the crash. Anna Lisa Balding was on the plane and said the weather had been “bad”. “Our pilot did an amazing job,” she added. BBC horse racing correspondent Cornelius Lysaght said it was believed the plane skidded on rain-soaked ground. Kirkland Tellwright, clerk of the course, said: “The bigger plane coming in skidded on landing, apparently spun and clipped the smaller plane. Jockey Dettori had been scheduled to ride James Garfield in the 32Red Sprint Cup but was replaced by Richard Kingscote. Dettori was injured in 2000 when the light aircraft he was travelling in crash-landed shortly after take-off at Newmarket racecourse. The pilot Patrick Mackey died in the accident.